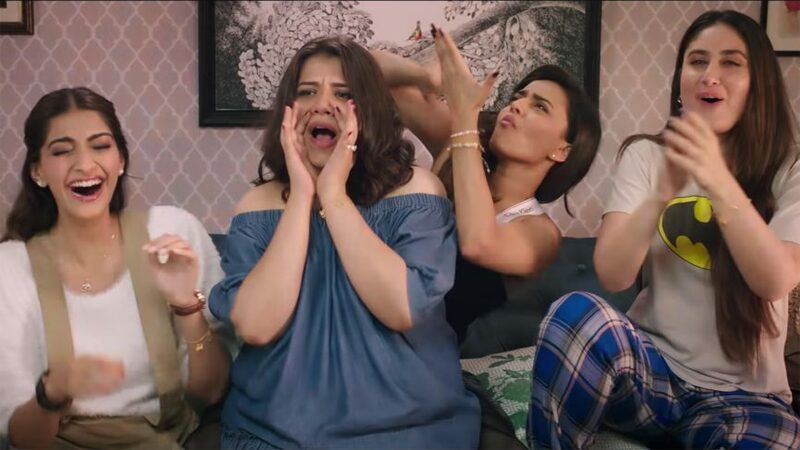 Shashanka Ghosh directs Kareena Kapoor Khan, Sonam Kapoor, Swara Bhaskar and Shikha Talsania in “not a chic-flick” Veere di Wedding. After the career ending critique from “The Aunty”, I was going in with abysmal expectation and maybe that or maybe the fact that I saw it with Kareena’s biggest fan in the world – I found the movie to be mildly entertaining and brimming with potential. Kalindi played by Kareena is friends with Avni played by Sonam Kapoor, Sakshi played by Swara Bhaskar and Meera played by Shikha Talsania. Kalindi lives in Australia with her boyfriend Rishab played by Sumeet Vyaas who proposes to her and Kalindi accepts reluctantly. She returns to India and the 4 BFFs get together for their Veere’s wedding. Avni is a ball-busting family lawyer permanently harassed by her well-meaning mother played by the fantastic Neena Gupta to get married. Sakshi is a rich party girl who got married to a NRI in a rush and is now back to staying with her parents who do not really know what transpired for the marriage to break down. Meera married an American and lives in America raising her young child and probably the most “normal” of the bunch. The four friends get back together and each of their respective storyline unravels. Kareena is for most parts hilarious as she goes about the Big Fat Indian (Delhi) wedding charade nervously scratching as she is made to dress up in ridiculous outfits and paraded in front of relatives who are of no consequence. Sonam Kapoor continues her trademark vapid and vacuous portrayal of any character she lays her hands on. Her dialogue delivery couldn’t be more stunted. Swara Bhaskar – as the aunty said – is playing a rich girl for the first time and it is a poor man’s idea of what a rich person does all day. Her dishevelled look with a cigarette permanently stuck in her mouth with sunglasses that serve no purpose as she peers from above is just an abhorrent performance. Nothing about her feels believable. Meera lives in America with her Caucasian husband John after having been disowned by her family for marrying “outside” the religion. She is the most believable and the most likeable. They try to give her a flaw too – excessive drinking but it feels half-baked and an after-thought. Shikha is the best thing about this movie and I cannot wait for her to headline a project all on her own where she is unencumbered by the lesser talented actresses. She has a Ugly Betty/ Jane the Virgin vibe about her that I cannot shake and I want the nouveau brave Bollywood to take a chance with her! 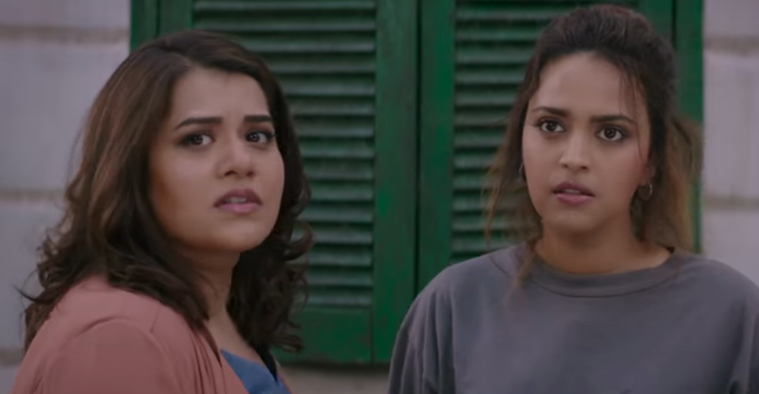 The biggest problem is that director Shashanka Ghosh and writers Nidhi Mehra and Mehul Suri try to make this feature film in the vein of producer Ekta Kapoor’s multiple story arc TV-shows. There is simply too much going on and at 2 hours there is not nearly enough time to resolve even one story arc to successful completion. Take this for instance, Kalindi is reticent to get married because her parents used to fight a lot, her mother passed away and her father remarried to a socialite, she is estranged from her father, who is estranged from his gay-brother who is the only family Kalindi knows of. Then there is the whole insane plot about Kalindi’s Fiancé’s family being fraudsters. 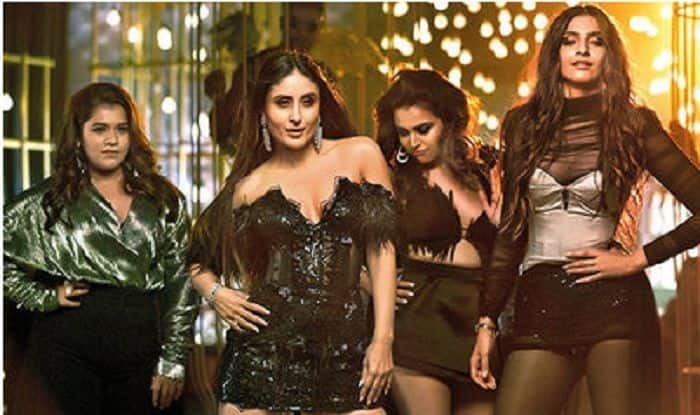 Sonam and Kareena went around town lamenting about how difficult it was to get a female-led film financed and it shows – there are awkward product placements after awkward product placements and they are not even trying to be subtle. 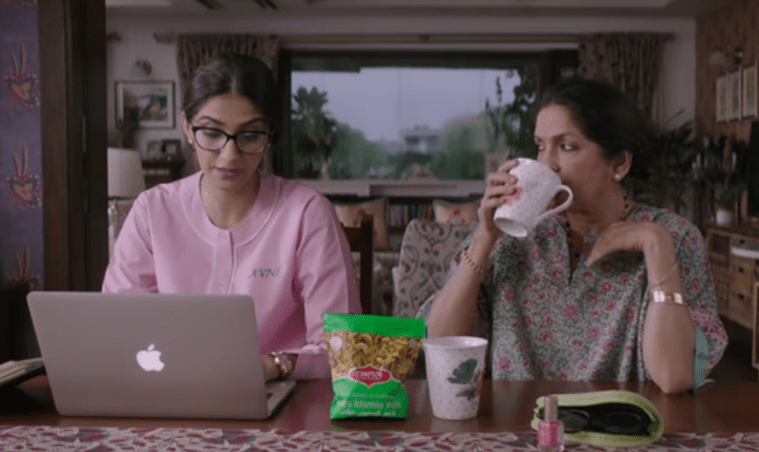 Bikaji snacks get more screen-time than the amazing Neena Gupta and that is a crime against cinema. Also at the very end of the film some random local furniture company’s product placement literally made me lose it. With Sonam being the driving force behind this movie getting made it was always going to be fashion centric and for most parts the fashion is exceptional and forward looking except for that one ridiculous outfit that Kareena wears for her wedding. A 25-year old vintage Abu Jani and Sandeep Khosla outfit deserved to be better treated than that. The dialogues are mostly fun but when they go for crass they really go for it and the payoff is limited. The songs are mostly forgettable except Tareefan which only really plays when the credits roll. Lastly I am reminded of the Instagram post that Neena Gupta shared on Instagram where she simply stated “I live in Mumbai and working am a good actor looking fr good parts to play” and I couldn’t be more thrilled to finally seeing her on the big stage. She is a treasure and I do hope she gets more roles and meatier characters to play because even in the limited screen time she is allotted here she really shines through. It might be the Kool-aid talking but I did not hate Veere di Wedding. There was incredible potential had the writers and director taken one of the girl’s tracks and resolved that story arc and made this into an anthology the result would have been a lot more successful. This entry was posted in movie, review and tagged abu jani sandeep khosla, air india, airport look, bff, big fat indian wedding, bikaji, bollywood, chick flick, clothes, ekta kapoor, fashion, feminism, girls, Kareena Kapoor, kareena kapoor khan, neena gupta, red carpet, shashanka ghosh, shikha talsania, sonam kapoor, swara bhaskar, tareefan, tata, uber, veere di wedding by ViralVora. Bookmark the permalink.